For some reason, within my 29 years of living, I've never made bread from scratch. Well, I have now! I acquired a baking book by Emma Patmore. It's an excellent book, with easy to follow instructions. I made the Garlic Rolls, I've been coveting the Garlic & Sage Bread but thought I'd leave that for now. Due to not being very good at following recipes (and not owning a blender, I've adapted some of the instructions). Right, peel and chop the Garlic Cloves up really small, boil and simmer in the Milk for 15 minutes. Meanwhile, mix together the Flour, Salt & Yeast. When the garlicky Milk has cooled, add the Oil and Egg, pour gradually into the Flour while mixing. I found that my mixture was gunky and wet, so threw lots of flour on the side when beating, which helped dry it up. Beat up (knead) the dough for a little while on a floured side, and then leave for one hour, in a greased container, covered by a cloth. Once it's expanded to twice the size or larger, beat it up for a couple of minutes and then separate into eight different rolls, or more if you want small ones (I'm tempted to insert some garlic butter next time). Place on a greased baking tray, score the tops of the rolls, dip in Milk (or brush some Milk on the top, if you own a fancy basting brush), sprinkle some Rock Salt, or grated Garlic on top, or cheese? Put into a pre-heated oven at 220c/425f/Gas Mark 7 for 15-20 minutes. 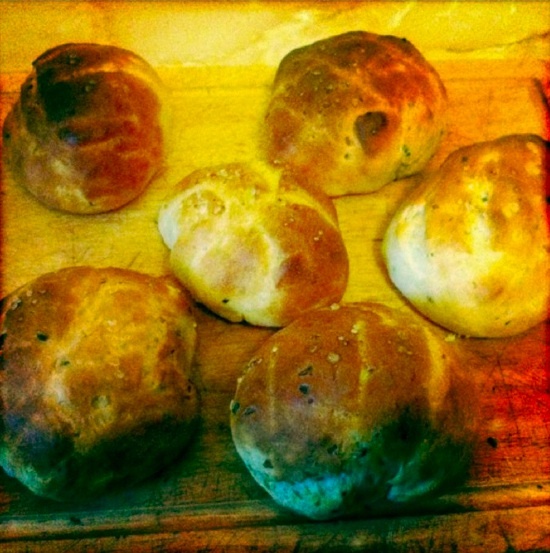 Et Voila - tasty rolls!